Like many things in life, when people don't want to have me poking around into something, I wonder why. My curious mind and probing questions have led me into trouble since I was a very small child. Back then, I had to deal with the wrath of my parents. One can't help but overhear things when living in a tiny house with many occupants, and the sage advice of "If you want to learn about something, ask questions." became a double edged sword. 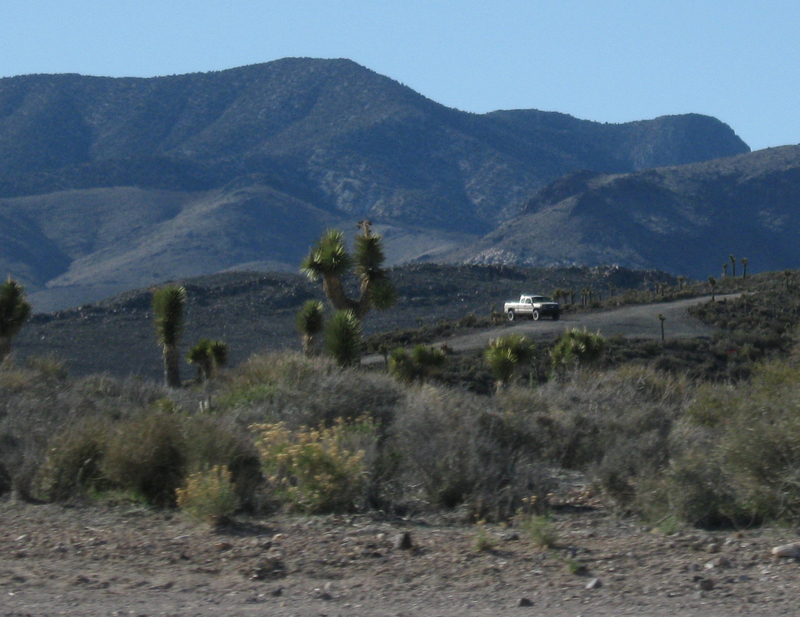 Some folks seemed to be mighty curious as to why I like traveling out in the fascinating and remarkable Nevada desert. It's very simple really, and those who know me should have known: If you don't want me to see or know about something, I'll make it a point to follow up, and dig deeper. Here are a couple of pix from my 2004 adventure. This one of me was taken by a friend. Copyright 2004 by C.A. 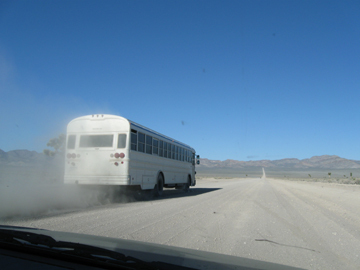 White bus blowing gray "cover" or signal smoke which intensified on Groom Lake Road, and passed my ride at a speedy clip. 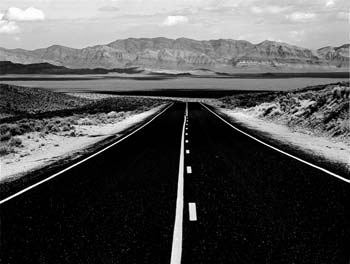 The gray smoke continued to be expelled from the bus, until it arrived at the intersection of Groom Lake Road and NV Highway 375. Of course, road dust was part of the mix, but the color behind my ride, and that of a pickup truck we passed was a light beige. 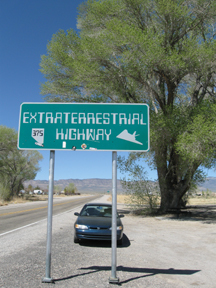 Word on the street is that such buses transport passengers between Las Vegas and Area 51 base. During a "Leaf Date" in 2008 with a Special Forces man, I asked him what might happen to someone who might see and yap about something that the government might not want to have out in the public knowledge base. He calmly shrugged and said "concrete boots." I prefer mine of black leather, and haven't been forced to revise my fashion statement. The Guard truck on the hill on the restricted area side. 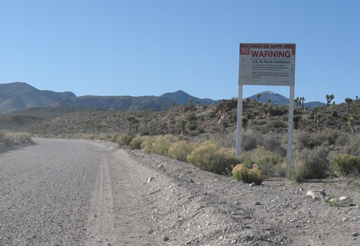 No Photography, No Admittance, and this is an Air Force Installation sign on Groom Lake Road. Kinda stating the obvious to say that the Welcome Wagon wasn't in sight. 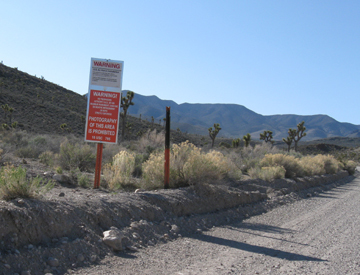 sign had been recycled from a Restricted Area sign to be site specific. 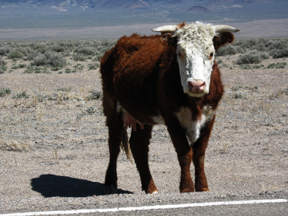 Nevada has much land which is known as "open range" and the land between Rachel, NV and Alamo, NV was dotted with cattle roaming, grazing, and loafing. I've never noticed cattle in that area on my previous visits, only a few dried cow pies. This heifer appears to have missed being part of that unusual activity known as "cattle mutilations" . 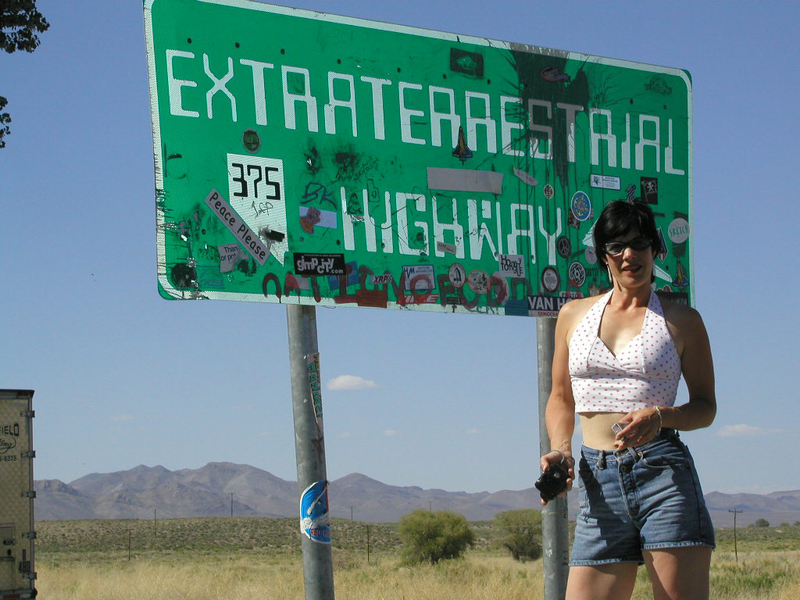 http://www.earthfiles.com has much information, and Linda Moulton Howe has been researching this topic for many years.